If you were a child in the ancient Indus valley, what would an average day be like for you? One thing about childhood in the Indus city of Harappa that emerges very clearly from the human skeletal remains is that the different mortuary populations at the site experienced life in very different ways. There are few skeletal remains from immature individuals in the urban period cemetery R-37. However, we do have indirect evidence about the lives of children from the analysis of teeth from adult skeletons. Because teeth form in childhood and dental enamel does not remodel, we can use the evidence from teeth to infer aspects of early life from a skeleton. In a study of defects in the dental enamel, which can result from over 200 known stressors in early childhood, John Lukacs found that 72% of the 36 individuals he studied from the urban period cemetery (R-37) at Harappa demonstrated evidence of brief periods of growth disruption. Male children were overall less likely to demonstrate these kinds of growth defects, which might suggest female children were more likely to suffer deprivation or harsh circumstances because of their gender but it could also be seen as support for the claim that male children did not spend their early years in the city. The recent application of archaeological chemistry techniques to adult skeletons from Harappa has led to the suggestion that urban period Harappans were a heterogeneous group of people that included a large number of immigrants, many of whom appear to have come to the city as children, possibly even as part of a system of fosterage. Bioarchaeologists can look at where a person may have grown up based on Strontium (Sr) and Lead (Pb) isotopes, which are incorporated throughout infancy and childhood into hard tissues like tooth enamel. By comparing the isotopic ratios in teeth with those of local geological profiles, we can determine whether an individual was living in the local area during the time that different teeth formed in infancy and childhood. Furthermore, by comparing results of this analysis between first and second molars from the same individual, one can try to infer the age of the individual when the migration occurred. Based on the results of one such study, scientists have argued that a large number of people buried at Harappa in the urban period had been born in the northwestern regions of India (Potwar Plateau) and the region around the upper Indus tributaries (Valentine 2016). These results further support the claim that people (particularly the males) buried in the city cemetery (R-37) were immigrants (Kenoyer et al. 2013), possibly merchants and traders who had come to Harappa early in life, as early as 3-5 years for many, and subsequently learned their craft or trade and made their living here (Valentine et al. 2015). We have a different kind of evidence concerning the life of children in the transitional and the post-urban, disintegration periods; there are skeletal remains from children in the Area G mortuary assemblage (c. 2000 BCE) and there are also infants and children who were buried in Cemetery H, from both the post-urban (1900-1700 BCE) and the Chalcolithic period (1700-1300 BCE) at the site. The Area G skeletal assemblage includes remains from a minimum number of 20 individuals, most of whom were represented by cranial remains; decapitations (natural or otherwise) were interred in Area G alongside some articulated body parts (spinal columns or legs), isolated bones of humans and animals, and a single intact body (whose head was located to the left side of the rib cage). Of 9 childrens’ crania in this deposit at Area G, 2 had suffered cranial trauma. One of those individuals had two injuries from a long object, round in profile, similar to a stick or a club. One of those blows had struck the forehead and the other was delivered to the back of the cranium, behind the left ear (Robbins Schug et al. 2012). The other child was injured on the back right side of the cranium, where a small depression fracture had affected the surface of the cranium in a much milder injury. An interesting thing about these two crania is that they both belonged to 5-year old children (based on the presumed timing of the eruption of the first molar) who shared a cranial deformation known as plagiocephaly (so named for the lop-sided visage it creates). More details on this are forthcoming (Robbins Schug, in prep). The infants and children in both Area G and Cemetery H suffered from vitamin C deficiency, or scurvy (Robbins Schug and Blevins 2016). Of the 9 children buried in Area G, 5 of them had abnormal porosity on their skeletal elements and the patterning of these lesions suggested scurvy for 3 of them (33%). The presence of scurvy in this sample, when it was absent in the infants examined from Cemetery H statrum II (the post-urban cemetery) supports claims that perhaps the individuals buried in Area G were buried here because of their communal identity, an identity which also put them at greater risk for violence (Robbins Schug et al. 2012), disease (Robbins Schug et al. 2013), and malnourishment (Robbins Schug and Blevins 2016). Of the 15 immature skeletons studied from the Cemetery H stratum I sample, 6 of them (40%) had periosteal new bone growth or abnormal porosity and scurvy was considered a reasonable possibility for 5 of them. The fact is that most of these individuals were young perinates, at or around the time of birth when they died. This strongly indicates that maternal scurvy was severe enough in the Chalcolithic period at Harappa that pregnancy and breastfeeding could not buffer these infants from malnourishment (Robbins Schug and Blevins 2016). Thus the evidence does not provide a complete picture of childhood in the Indus civilization, or even a complete picture of childhood in an Indus city. However, bioarchaeology has contributed the following major insights on this question: male children who were buried in the cemetery in the urban period were often immigrants who came to Harappa early in life from NW India, among other places, perhaps as part of a system of fosterage; male children who were buried in R-37 were less likely to suffer stressful life circumstances that disrupt dental formation than the female children but there was a high prevalence of stressful circumstances in general for children who grew up to be buried in this cemetery; in the transitional period at the site, a group of people were interred in a deposit known as Area G and of them, there were 9 children who had a greater prevalence of traumatic injury and micronutrient deficiency; two of these children also had cranial deformation (which will be interpreted further in a forthcoming book chapter); by the Chalcolithic period, there were larger numbers of young infant and childrens’ remains buried in the cemetery (H, stratum I) and of these children, a high proportion had suffered vitamin C deficiencies that suggest severe maternal malnourishment. Like any day of a child of a Sindhi village nowadays. A lot of toys have been excavated from various archaeological sites of the Indus Valley civilization which were probably made for children. Examples of these toys include toy-cart, dice, whistles, board games, etc. There was a long and continuing tradition of metallurgy, bead-making, pottery etc. in the Indus Valley civilization. Their craftsmanship is evident in their exquisite jewelry pieces, metal artifacts, pots and vessels of various shapes and sizes, seals and so on. In addition, farming, food processing and trade would have been important occupations. Their writing has a rich syntax with an underlying logic in its structure (Yadav et al. 2010). A lot of thought, planning and utility issues have also been taken into consideration while designing their signs too (Yadav and Vahia, 2011). All these would require systematic transfer of knowhow from one generation to another. Hence, some form of formal or informal training of youngsters would have been required. Similarly, their architecture, city planning, water management etc. would have required both, planners and workers. This would have also required sophisticated training. Hence, a significant fraction of the young minds would have been put through such training. I would have to guess but most likely, they were engaged in assisting their parents in farming and animal care. Some time in the day may have been given over to play, in which the animal figurines and carts might have been used in play acting. 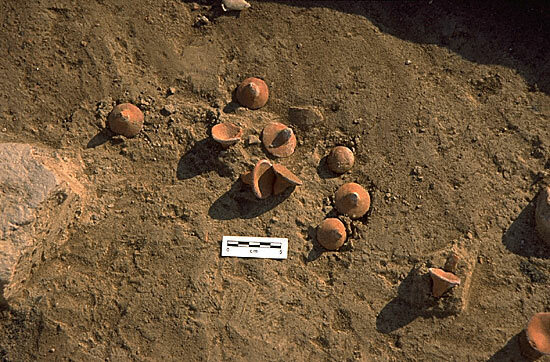 Above: Detail of terracotta tops found in Room 202 (Trench 43), Harappa.